Trade contractors having ICI collective agreements with either the Labourers International Union of North America (LIUNA) or the Operative Plasterers Cement Masons International Association Local 598 (OPCMIA 598) are represented through Ministerial designation by the CFLRA. 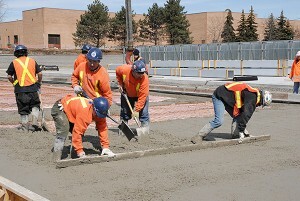 Our unionized journeymen, and their apprentices, provide the highest quality workmanship available in the concrete finishing industry today. We support a level playing field for employers and the need for skilled workers to have fair wages, health benefits and a retirement pension. Feel free to browse information for Apprenticeship Training.